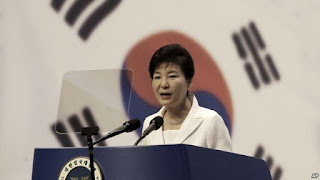 South Korean President Park Geun-hye delivers a speech during a ceremony to celebrate Korean Liberation Day from Japanese colonial rule in 1945, at Seong Cultural Center in Seoul, South Korea, Aug. 15, 2015. South Korean President Park Geun-hye expressed muted criticism of Japanese Prime Minister Shinzo Abe and rebuked Pyongyang’s provocative behavior at a commemoration marking the 70th anniversary of the Korean peninsula's liberation from Japanese colonial rule from 1910-1945. On the anniversary of the end of World War II Friday, Japanese Prime Minister Shinzo Abe expressed deep remorse and condolences, but stopped short of satisfying Seoul’s demand that he sincerely apologize. “There are several parts that could have been better addressed from our perspective,” said President Park. The South Korean president has refused to meet with the Japanese leader until he directly apologizes for the hundreds of thousands of so called “comfort women” in Asia who were forced into prostitution by the Japanese military during the war. In his statement Abe made a broad reference to women who suffered and whose dignity was denied but did not mention comfort women by name. President Park seemed to indicate in her speech that Seoul would overlook Abe’s omissions and focus instead on his promise to uphold apologies by past Japanese leaders including the 1993 Kono Statement that offered apologies and remorse to comfort women. “Despite that, the predecessors of Japan in their past statements based on remorse and reflection acknowledged the suffering and pain inflicted on the so called "comfort women” and the many countries in Asia that endured the aggression and colonial rule of Japan,” President Park said. While Seoul and Tokyo may try to put aside historical disagreements to maintain their strong economic and security ties, Hosaka Yuji, a political science professor at Sejong University in Seoul says this issue will continue to be a point of contention between the two leaders. “I think it has become very difficult for South Korea and Japan to hold a summit.” Hosaka said. North Korea’s Foreign Ministry issued a more critical response to Abe's statement saying it, “did not refer to the honest admission and apology for Japan's history of aggression.” The ministry’s response was carried by the state controlled Korean Central News Agency. President Park also addressed the longstanding the division of Korea. “As we celebrate the 70th anniversary of liberation we must conclude this history of division, and work together to open the future for peaceful reunification,” Park said. The cold war between the U.S. and Soviet Union that was responsible for the division of the Korean peninsula at the end of WWII ended over 25 years ago. Yet today the two sides seem further apart than ever. The Korean War that erupted in the 1950s ended with an amnesty, not a peace treaty. Since then a strong military presence on both sides of the Korean border has helped keep an uneasy peace. The two Koreas have developed diametrically opposed political and economic systems. South Korea has experienced unprecedented economic growth and developed into a stable democracy while the North remains a closed authoritarian society plagued with pervasive poverty. But a decade ago South Korea was committed to a “sunshine policy of engagement” providing the North with unconditional aid and investment. In 2005 North Korea's senior Communist Party officials participated in a joint independence celebration in Seoul. And there were efforts made for families separated by the North-South division to reunite if only through a video connection. Pyongyang’s pursuit of nuclear weapons and provocations including a 2010 attack on a South Korean naval vessel that killed 46 sailors led Seoul to disengage and impose harsh sanctions against the North. Recently Seoul accused the North Korean military of planting landmines on the southern side of the demilitarized border zone that wounded two soldiers. President Park called on Pyongyang to end its nuclear development program and confrontational behavior, and enter into dialogue with Seoul. The South Korean president urged leaders in the North to begin cooperating on mutually beneficial projects like facilitating cross-border family reunions, sports and cultural exchanges and building a trans-Korea railroad. However, Moon Chung-in, a politics professor at Yonsei University in Seoul says divisions within South Korea over whether to engage the North or work for its collapse undermine any progress toward unification. “We should come up with a national consensus at home first, then we can have a meaningful peace making and peace building on the Korean peninsula,” said Moon. Tensions have increased at the border area following the land mine incident. Seoul responded by restarting long dormant anti-government broadcasts over loudspeakers at the border. North Korea denied any involvement in placing the landmines and threatened Saturday to carry out "indiscriminate strikes" on South Korea unless Seoul halts these broadcasts along their border.